The property at Allora Vineyards was purchased in 1998. At the time, the land was fallow and had been used as a pasturage for almost a century. This left the ground rich with mineral deposits and fertile soils. The Napa River also runs directly behind Allora Vineyards and delivers a “taste of the hills” when the rains come. We believe and many noted wine makers in Napa Valley concur, that the famous alluvial fan of the Napa River is pivotal in soils and terroirs of the Valley. We also have a unique micro-climate, lending to a slightly cooler weather canopy at the vineyard. In the end, this all enhances the taste. Today, Saint Helena is known as “the heart of the Napa Valley” and the Klein family is proud to own this piece of history. We are surrounded by wonderful neighbors who make incredible wines. Our passion starts in the vineyards and continues to express itself throughout the wine making process. Simply stated, good wines begin with good grapes. This places farming at the core of exceptional wine making. Hard work and care are not optional when it comes to vineyard maintenance. The vineyard location on the valley floor allows the vineyard ideal sun exposure. 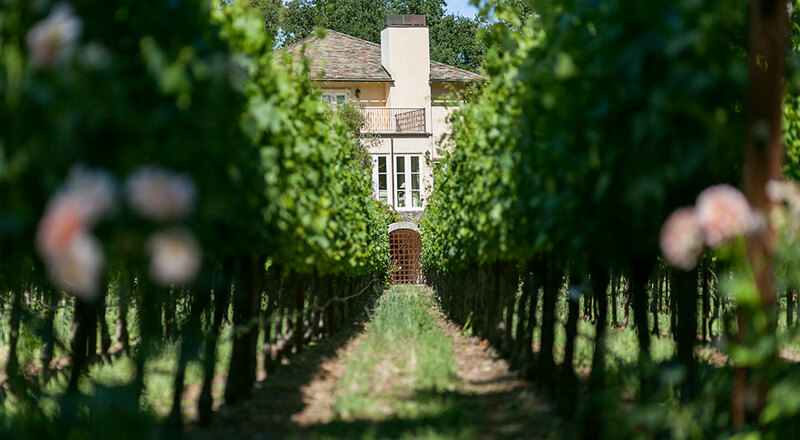 On a map, you will notice that Allora Vineyards is located at one of the narrowest parts of the entire valley and for that reason a moderate breeze allows for even ripening of the fruit. Presently, ten acres of grapevines are planted at Allora Vineyards on the Klein’s estate. Eight acres are Cabernet Sauvignon vines and the remaining two acres consist of Cabernet Franc and Petite Sirah. Additionally, the vineyard employs a unique planting style in which the vines are grown closely together, forcing each plant to produce only a small amount of high quality fruit. The first harvest at Allora Vineyards occurred in the fall of 2002 and has been producing exceptional wine with each new vintage.